Itchy skin can be a very irritating phenomenon, which can disturb your peace of mind, daily routine activities and even your stretch of peaceful night sleep. The funny thing about an itchy skin is that it may be due to something as insignificant as the cold winter weather or something as sinister as cancer! So what does your skin itch mean? What causes itching of skin? Any substance that irritates your sensitive skin could lead to an allergic reaction and itching. To know what triggered your itching, make a mental note of any new substance that you have most recently come into contact with – soap, cosmetic (cream, perfume, hair dye, nail varnish etc.) jewelry (containing nickel or cobalt), food, or clothing material (latex gloves, wool), plants (sunflowers, tulips or chrysanthemums), medications (antibiotics, anti fungal drugs or opioid pain medications)… anything under the sun… and even the sun! Menopause and Pregnancy are two events which can cause a sea of change in the hormone levels in a lady. This can cause itchy skin. Certain skin conditions can also come up specifically during pregnancy (technically called prurigo gestationis and pruritic urticarial papules & plaques of pregnancy or PUPPP). 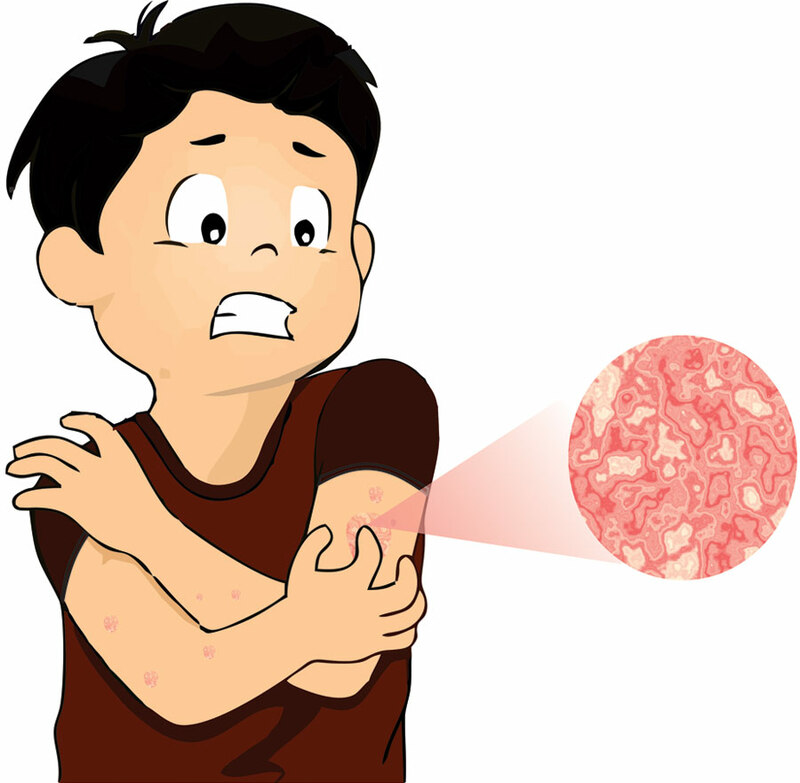 There are dozens of skin conditions and infections which can cause itching of skin like psoriasis, urticaria, eczema, chickenpox, scabies, fungal infections, etc. These are usually accompanied by a rash or eruptions. Surprisingly, a number of internal diseases can also cause skin itching like liver diseases, iron deficiency anemia, kidney failure, problems involving the thyroid and even cancers like leukemia or lymphoma. Certain conditions involving the nerves may also cause itching of the skin – diabetes, herpes zoster, pinched nerves or a condition called multiple sclerosis. What home remedies can I try for skin dryness? Skin Itching that is caused by Dryness can be easily taken care of at home. Coconut Oil, Aloe Vera and Petroleum Jelly are good natural moisturizers that can be applied. Cool wet compresses over the affected area can help with the itching. Soft, loose, cotton clothing will help to avoid irritating the skin. Prefer mild soaps without too many chemicals that rip the moisture off your skin. Do ensure that no soap remains on your washed bedding and towels. Quite a few people have embarrassingly realized this apparently- obvious, yet simple cause of itchy skin! Reduce stress – it has been known to worsen skin itching. When should I worry about my Skin Itching? do not hesitate from consulting your doctor for your skin itch. Can Homoeopathy help with my skin itch? Allergies: When it comes to skin itching due to Allergies, Homoeopathic medicines have proven to be excellent at balancing the disordered immune system and gradually preventing the recurrence of acute allergic episodes. Pregnancy and Menopause: Homoeopathic medicines are absolutely safe during pregnancy and do not cause any untoward side effects in the baby. They same can be said of skin itching due to changing hormones in menopausal ladies. Skin Diseases: Homoeopathy offers excellent results in skin diseases and can even bring about a reasonable cure in many long standing skin diseases where conventional medicine fails to offer a permanent solution like Tinea Versicolor (a fungal infection), Psoriasis, Chronic Urticaria, Eczema, etc. Diseases affecting Internal Organs: Depending on the stage of the disease, Homoeopathy can either offer a cure, reasonable control or palliative relief in skin itching. While not every skin itch is due to cancer, neither should it be trivially ignored. Do visit your doctor if just moisturizing your skin is not offering you substantial relief. You are always welcome to get in touch with us at Life Force Homoeopathy to seek a medical opinion and achieve a trustworthy solution with Homoeopathy by Dr Rajesh Shah.